Acetaminophen and codeine phosphate tablets expose patients and other users to the risks of opioid addiction, abuse and misuse, which can lead to overdose and death. Assess each patientâ€™s risk prior to prescribing acetaminophen and codeine phosphate tablets, and monitor all patients regularly for the development of these behaviors and conditions (see WARNINGS). Serious, life-threatening, or fatal respiratory depression may occur with use of acetaminophen and codeine phosphate tablets. Monitor for respiratory depression, especially during initiation of acetaminophen and codeine phosphate tablets or following a dose increase (see WARNINGS). Accidental ingestion of acetaminophen and codeine phosphate tablets, especially by children, can result in a fatal overdose of acetaminophen and codeine phosphate tablets (see WARNINGS). Life-threatening respiratory depression and death have occurred in children who received codeine. Most of the reported cases occurred following tonsillectomy and/or adenoidectomy and many of the children had evidence of being ultra-rapid metabolizers of codeine due to a CYP2D6 polymorphism (see WARNINGS, PRECAUTIONS; Information for Patients/Caregivers, Nursing Mothers). Acetaminophen and codeine phosphate tablets are contraindicated in children younger than 12 years of age and in children younger than 18 years of age following tonsillectomy and/or adenoidectomy (see CONTRAINDICATIONS). Avoid the use of acetaminophen and codeine phosphate tablets in adolescents 12 to 18 years of age who have other risk factors that may increase their sensitivity to the respiratory depressant effects of codeine. Acetaminophen and codeine phosphate tablets, USP are supplied in tablet form for oral administration. In addition, each acetaminophen and codeine phosphate tablet, USP contains the following inactive ingredients: croscarmellose sodium, crospovidone, lactose monohydrate, magnesium stearate, microcrystalline cellulose, povidone, pregelatinized starch and stearic acid. Codeine is rapidly absorbed from the gastrointestinal tract. It is rapidly distributed from the intravascular spaces to the various body tissues, with preferential uptake by parenchymatous organs such as the liver, spleen, and kidney. Codeine crosses the blood-brain barrier and is found in fetal tissue and breast milk. The plasma concentration does not correlate with brain concentration or relief of pain. Codeine is about 7% to 25% bound to plasma proteins and does not accumulate in body tissues. About 70% to 80% of the administered dose of codeine is metabolized by conjugation with glucuronic acid to codeine-6-glucuronide (C6G) and via O-demethylation to morphine (about 5 to 10%) and N-demethylation to norcodeine (about 10%) respectively. UDP-glucuronosyltransferase (UGT) 2B7 and 2B4 are the major enzymes mediating glucuronidation of codeine to C6G. Cytochrome P450 2D6 is the major enzyme responsible for conversion of codeine to morphine and P450 3A4 is the major enzyme mediating conversion of codeine to norcodeine. Morphine and norcodeine are further metabolized by conjugation with glucuronic acid. 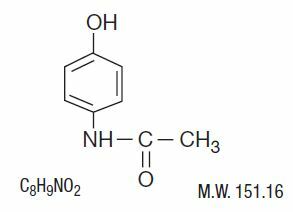 The glucuronide metabolites of morphine are morphine-3-glucuronide (M3G) and morphine-6-glucuronide (M6G). Morphine and M6G are known to have analgesic activity in humans. The analgesic activity of C6G in humans is unknown. Norcodeine and M3G are generally not considered to possess analgesic properties. Acetaminophen is rapidly absorbed from the gastrointestinal tract and is distributed throughout most body tissues. A small fraction (10% to 25%) of acetaminophen is bound to plasma proteins. The plasma half-life is 1.25 to 3 hours, but may be increased by liver damage and following overdosage. Elimination of acetaminophen is principally by liver metabolism (conjugation) and subsequent renal excretion of metabolites. Acetaminophen is primarily metabolized in the liver by first-order kinetics and involves three principal separate pathways: conjugation with glucuronide; conjugation with sulfate; and oxidation via the cytochrome, P450-dependent, mixed-function oxidase enzyme pathway to form a reactive intermediate metabolite, which conjugates with glutathione and is then further metabolized to form cysteine and mercapturic acid conjugates. The principal cytochrome P450 isoenzyme involved appears to be CYP2E1, with CYP1A2 and CYP3A4 as additional pathways. Approximately 85% of an oral dose appears in the urine within 24 hours of administration, most as the glucuronide conjugate, with small amounts of other conjugates and unchanged drug. Acetaminophen and codeine phosphate tablets are indicated for the management of mild to moderate pain, where treatment with an opioid is appropriate and for which alternative treatments are inadequate. Because of the risks of addiction, abuse, and misuse, with opioids, even at recommended doses (see WARNINGS), reserve acetaminophen and codeine phosphate tablets for use in patients for whom alternative treatment options (e.g., non-opioid analgesics). Acetaminophen and codeine phosphate tablets contain codeine. Codeine in combination with acetaminophen, is a Schedule III controlled substance. As an opioid, acetaminophen and codeine phosphate tablets expose users to the risks of addiction, abuse, and misuse (see DRUG ABUSE AND DEPENDENCE). Assess each patientâ€™s risk for opioid addiction, abuse, or misuse prior to prescribing acetaminophen and codeine phosphate tablets, and monitor all patients receiving acetaminophen and codeine phosphate tablets for the development of these behaviors and conditions. Risks are increased in patients with a personal or family history of substance abuse (including drug or alcohol abuse or addiction) or mental illness (e.g., major depression). The potential for these risks should not, however, prevent the proper management of pain in any given patient. Patients at increased risk may be prescribed opioids such as acetaminophen and codeine phosphate tablets, but use in such patients necessitates intensive counseling about the risks and proper use of acetaminophen and codeine phosphate tablets along with intensive monitoring for signs of addiction, abuse, and misuse. Opioids are sought by drug abusers and people with addiction disorders and are subject to criminal diversion. Consider these risks when prescribing or dispensing acetaminophen and codeine phosphate tablets. Strategies to reduce these risks include prescribing the drug in the smallest appropriate quantity and advising the patient on the proper disposal of unused drug (see PRECAUTIONS; Information for Patients/Caregivers). Contact local state professional licensing board or state controlled substances authority for information on how to prevent and detect abuse or diversion of this product. Serious, life-threatening, or fatal respiratory depression has been reported with the use of opioids, even when used as recommended. Respiratory depression, if not immediately recognized and treated, may lead to respiratory arrest and death. Management of respiratory depression may include close observation, supportive measures, and use of opioid antagonists, depending on the patientâ€™s clinical status (see OVERDOSAGE). Carbon dioxide (CO2) retention from opioid-induced respiratory depression can exacerbate the sedating effects of opioids. To reduce the risk of respiratory depression, proper dosing and titration of acetaminophen and codeine phosphate tablets are essential (see DOSAGE AND ADMINISTRATION). Overestimating the acetaminophen and codeine phosphate tablets dosage when converting patients from another opioid product can result in a fatal overdose with the first dose. Accidental ingestion of acetaminophen and codeine phosphate tablets, especially by children, can result in respiratory depression and death due to an overdose of codeine. Acetaminophen and codeine phosphate tablets are contraindicated for all children younger than 12 years of age (see CONTRAINDICATIONS). Acetaminophen and codeine phosphate tablets are contraindicated for post-operative management in pediatric patients younger than 18 years of age following tonsillectomy and/or adenoidectomy (see CONTRAINDICATIONS). Avoid the use of acetaminophen and codeine phosphate tablets in adolescents 12 to 18 years of age who have other risk factors that may increase their sensitivity to the respiratory depressant effects of codeine unless the benefits outweigh the risks. Risk factors include conditions associated with hypoventilation, such as postoperative status, obstructive sleep apnea, obesity, severe pulmonary disease, neuromuscular disease, and concomitant use of other medications that cause respiratory depression. (see WARNINGS). At least one death was reported in a nursing infant who was exposed to high levels of morphine in breast milk because the mother was an ultra-rapid metabolizer of codeine. Breastfeeding is not recommended during treatment with acetaminophen and codeine phosphate tablets. Some individuals may be ultra-rapid metabolizers because of a specific CYP2D6 genotype (e.g., gene duplications denoted as *1/*1xN or *1/*2xN). The prevalence of this CYP2D6 phenotype varies widely and has been estimated at 1% to 10% for Whites (European, North American), 3% to 4% for Blacks (African Americans), 1% to 2% for East Asians (Chinese, Japanese, Korean), and may be greater than 10% in certain racial/ethnic groups (i.e., Oceanian, Northern African, Middle Eastern, Ashkenazi Jews, Puerto Rican). These individuals convert codeine into its active metabolite, morphine, more rapidly and completely than other people. This rapid conversion results in higher than expected serum morphine levels. Even at labeled dosage regimens, individuals who are ultra-rapid metabolizers may have life-threatening or fatal respiratory depression or experience signs of overdose (such as extreme sleepiness, confusion, or shallow breathing) (see OVERDOSAGE). Therefore, individuals who are ultra-rapid metabolizers should not use acetaminophen and codeine phosphate tablets. Prolonged use of acetaminophen and codeine phosphate tablets during pregnancy can result in withdrawal in the neonate. Neonatal opioid withdrawal syndrome, unlike opioid withdrawal syndrome in adults, may be life-threatening if not recognized and treated, and requires management according to protocols developed by neonatology experts. Observe newborns for signs of neonatal opioid withdrawal syndrome and manage accordingly. Advise pregnant women using opioids for a prolonged period of the risk of neonatal opioid withdrawal syndrome and ensure that appropriate treatment will be available (see PRECAUTIONS; Information for Patients/Caregivers, Pregnancy). The effects of concomitant use or discontinuation of cytochrome P450 3A4 inducers, 3A4 inhibitors, or 2D6 inhibitors with codeine are complex. Use of cytochrome P450 3A4 inducers, 3A4 inhibitors, or 2D6 inhibitors with acetaminophen and codeine phosphate tablets requires careful consideration of the effects on the parent drug, codeine, and the active metabolite, morphine. The concomitant use of acetaminophen and codeine phosphate tablets with all cytochrome P450 3A4 inhibitors, such as macrolide antibiotics (e.g., erythromycin), azole-antifungal agents (e.g., ketoconazole), and protease inhibitors (e.g., ritonavir) or discontinuation of a cytochrome P450 3A4 inducer such as rifampin, carbamazepine, and phenytoin, may result in an increase in codeine plasma concentrations with subsequently greater metabolism by cytochrome P450 2D6, resulting in greater morphine levels, which could increase or prolong adverse reactions and may cause potentially fatal respiratory depression. The concomitant use of acetaminophen and codeine phosphate tablets with all cytochrome P450 3A4 inducers or discontinuation of a cytochrome P450 3A4 inhibitor may result in lower codeine levels, greater norcodeine levels, and less metabolism via 2D6 with resultant lower morphine levels. This may be associated with a decrease in efficacy, and in some patients, may result in signs and symptoms of opioid withdrawal. Follow patients receiving acetaminophen and codeine phosphate tablets and any CYP3A4 inhibitor or inducer for signs and symptoms that may reflect opioid toxicity and opioid withdrawal when acetaminophen and codeine phosphate tablets are used in conjunction with inhibitors and inducers of CYP3A4 (see WARNINGS; Drug Interactions). If concomitant use of a CYP3A4 inhibitor is necessary or if a CYP3A4 inducer is discontinued, consider dosage reduction of acetaminophen and codeine phosphate tablets until stable drug effects are achieved. Monitor patients for respiratory depression and sedation at frequent intervals. If concomitant use of a CYP3A4 inducer is necessary or if a CYP3A4 inhibitor is discontinued, consider increasing the acetaminophen and codeine phosphate tablets dosage until stable drug effects are achieved. Monitor for signs of opioid withdrawal (see PRECAUTIONS; Drug Interactions). The concomitant use of acetaminophen and codeine phosphate tablets with all cytochrome P450 2D6 inhibitors (e.g., amiodarone, quinidine) may result in an increase in codeine plasma concentrations and a decrease in active metabolite morphine plasma concentration which could result in an analgesic efficacy reduction or symptoms of opioid withdrawal. Follow patients receiving acetaminophen and codeine phosphate tablets and any CYP2D6 inhibitor for signs and symptoms that may reflect opioid toxicity and opioid withdrawal when acetaminophen and codeine phosphate tablets are used in conjunction with inhibitors of CYP2D6. If concomitant use with a CYP2D6 inhibitor is necessary, follow the patient for signs of reduced efficacy or opioid withdrawal and consider increasing the acetaminophen and codeine phosphate tablets dosage. After stopping use of a CYP2D6 inhibitor, consider reducing the acetaminophen and codeine phosphate tablets dosage and follow the patient for signs and symptoms of respiratory depression or sedation (see PRECAUTIONS; Drug Interactions). Profound sedation, respiratory depression, coma, and death may result from the concomitant use of acetaminophen and codeine phosphate tablets with benzodiazepines and/or other CNS depressants (e.g., non-benzodiazepine sedatives/hypnotics, anxiolytics, tranquilizers, muscle relaxants, general anesthetics, antipsychotics, other opioids, alcohol). Because of these risks, reserve concomitant prescribing of these drugs for use in patients for whom alternative treatment options are inadequate. Advise both patients and caregivers about the risks of respiratory depression and sedation when acetaminophen and codeine phosphate tablets are used with benzodiazepines or other CNS depressants (including alcohol and illicit drugs). Advise patients not to drive or operate heavy machinery until the effects of concomitant use of the benzodiazepine or other CNS depressant have been determined. Screen patients for risk of substance use disorders, including opioid abuse and misuse, and warn them of the risk for overdose and death associated with the use of additional CNS depressants including alcohol and illicit drugs (see PRECAUTIONS; Drug Interactions, Information for Patients/Caregivers). Acetaminophen and codeine phosphate tablets-treated patients with significant chronic obstructive pulmonary disease or cor pulmonale, and those with a substantially decreased respiratory reserve, hypoxia, hypercapnia, or pre-existing respiratory depression are at increased risk of decreased respiratory drive including apnea, even at recommended dosages of acetaminophen and codeine phosphate tablets (see WARNINGS; Life-Threatening Respiratory Depression). Life-threatening respiratory depression is more likely to occur in elderly, cachectic, or debilitated patients because they may have altered pharmacokinetics, including clearance, compared to younger, healthier patients (see WARNINGS; Respiratory Depression). Monitor such patients closely, particularly when initiating and titrating acetaminophen and codeine phosphate tablets and when acetaminophen and codeine phosphate tablets are given concomitantly with other drugs that depress respiration (see WARNINGS; Life-Threatening Respiratory Depression). Alternatively, consider the use of non-opioid analgesics in these patients. Monoamine oxidase inhibitors (MAOIs) may potentiate the effects of morphine, codeineâ€™s active metabolite, including respiratory depression, coma, and confusion. Acetaminophen and codeine phosphate tablets should not be used in patients taking MAOIs or within 14 days of stopping such treatment. Acetaminophen and codeine may cause severe hypotension including orthostatic hypotension and syncope in ambulatory patients. There is increased risk in patients whose ability to maintain blood pressure has already been compromised by a reduced blood volume or concurrent administration of certain CNS depressant drugs (e.g., phenothiazines or general anesthetics) (see PRECAUTIONS; Drug Interactions). Monitor these patients for signs of hypotension after initiating or titrating the dosage of acetaminophen and codeine phosphate tablets. In patients with circulatory shock acetaminophen and codeine phosphate tablets may cause vasodilatation that can further reduce cardiac output and blood pressure. Avoid the use of acetaminophen and codeine with circulatory shock. In patients who may be susceptible to the intracranial effects of CO2 retention (e.g., those with evidence of increased intracranial pressure or brain tumors), acetaminophen and codeine phosphate tablets may reduce respiratory drive, and the resultant CO2 retention can further increase intracranial pressure. Monitor such patients for signs of sedation and respiratory depression, particularly when initiating therapy with acetaminophen and codeine phosphate tablets. Opioids may also obscure the clinical course in a patient with a head injury. Avoid the use of acetaminophen and codeine phosphate tablets in patients with impaired consciousness or coma. There have been post-marketing reports of hypersensitivity and anaphylaxis associated with the use of acetaminophen. Clinical signs included swelling of the face, mouth, and throat, respiratory distress, urticaria, rash, pruritus, and vomiting. There were infrequent reports of life-threatening anaphylaxis requiring emergency medical attention. Instruct patients to discontinue acetaminophen and codeine phosphate tablets immediately and seek medical care if they experience these symptoms. Do not prescribe acetaminophen and codeine phosphate tablets for patients with acetaminophen allergy (see PRECAUTIONS; Information for Patients/Caregivers). Acetaminophen and codeine phosphate tablets are contraindicated in patients with gastrointestinal obstruction, including paralytic ileus. The administration of acetaminophen and codeine phosphate tablets or other opioids may obscure the diagnosis or clinical course in patients with acute abdominal conditions. Acetaminophen and codeine phosphate tablets may cause spasm of the sphincter of Oddi. Opioids may cause increases in serum amylase. Monitor patients with biliary tract disease, including acute pancreatitis, for worsening symptoms. The codeine in acetaminophen and codeine phosphate tablets may increase the frequency of seizures in patients with seizure disorders, and may increase the risk of seizures occurring in other clinical settings associated with seizures. Monitor patients with a history of seizure disorders for worsened seizure control during acetaminophen and codeine phosphate tablets therapy. Avoid the use of mixed agonist/antagonist (e.g, pentazocine, nalbuphine, and butorphanol) or partial agonist (e.g., buprenorphine) analgesics in patients who are receiving a full opioid agonist analgesic, including acetaminophen and codeine phosphate tablets. In these patients, mixed agonist/antagonist and partial analgesics may reduce the analgesic effect and/or precipitate withdrawal symptoms. When discontinuing acetaminophen and codeine phosphate tablets, gradually taper the dosage (see DOSAGE AND ADMINISTRATION). Do not abruptly discontinue acetaminophen and codeine phosphate tablets (see DRUG ABUSE AND DEPENDENCE). Acetaminophen and codeine phosphate tablets may impair the mental or physical abilities needed to perform potentially hazardous activities such as driving a car or operating machinery. Warn patients not to drive or operate dangerous machinery unless they are tolerant to the effects of acetaminophen and codeine phosphate tablets and know how they will react to the medication (see PRECAUTIONS; Information for Patients/Caregivers). Inform patients that the use of acetaminophen and codeine phosphate tablets, even when taken as recommended, can result in addiction, abuse, and misuse, which can lead to overdose and death (see WARNINGS). Instruct patients not to share acetaminophen and codeine phosphate tablets with others and to take steps to protect acetaminophen and codeine phosphate tablets from theft or misuse. Inform patients of the risk of life-threatening respiratory depression, including information that the risk is greatest when starting acetaminophen and codeine phosphate tablets or when the dosage is increased, and that it can occur even at recommended dosages (see WARNINGS). Advise patients how to recognize respiratory depression and to seek medical attention if breathing difficulties develop. Inform patients that accidental ingestion, especially by children, may result in respiratory depression or death (see WARNINGS). Instruct patients to take steps to store acetaminophen and codeine phosphate tablets securely. Advise patients to properly dispose of acetaminophen and codeine phosphate tablets in accordance with local state guidelines and/or regulations. Advise caregivers that acetaminophen and codeine phosphate tablets are contraindicated in all children younger than 12 years of age and in children younger than 18 years of age following tonsillectomy and/or adenoidectomy. Advise caregivers of children 12 to 18 years of age receiving acetaminophen and codeine phosphate tablets to monitor for signs of respiratory depression (see WARNINGS). Inform patients and caregivers that potentially fatal additive effects may occur if acetaminophen and codeine phosphate tablets used with benzodiazepines or other CNS depressants, including alcohol, and not to use these drugs concomitantly unless supervised by a healthcare provider (see WARNINGS, PRECAUTIONS; Drug Interactions). Inform patients not to take acetaminophen and codeine phosphate tablets while using any drugs that inhibit monoamine oxidase. Patients should not start MAOIs while taking acetaminophen and codeine phosphate tablets (see WARNINGS; Drug Interactions). Instruct patients how to properly take acetaminophen and codeine phosphate tablets (see DOSAGE AND ADMINISTRATION). If patients have been receiving treatment with acetaminophen and codeine phosphate tablets for more than a few weeks and cessation of therapy is indicated, counsel them on the importance of safely tapering the dose and that abruptly discontinuing the medication could precipitate withdrawal symptoms. Provide a dose schedule to accomplish a gradual discontinuation of the medication (see WARNINGS). Inform patients that acetaminophen and codeine phosphate tablets may cause orthostatic hypotension and syncope. Instruct patients how to recognize symptoms of low blood pressure and how to reduce the risk of serious consequences should hypotension occur (e.g., sit or lie down, carefully rise from a sitting or lying position) (see WARNINGS; Hypotension). Inform patients that anaphylaxis has been reported with ingredients contained in acetaminophen and codeine phosphate tablets. Advise patients how to recognize such a reaction, and if they develop signs of allergy such as a rash or difficulty breathing to stop taking acetaminophen and codeine phosphate tablets and seek medical attention. (see CONTRAINDICATIONS, ADVERSE REACTIONS). Inform female patients of reproductive potential that prolonged use of acetaminophen and codeine phosphate tablets during pregnancy can result in neonatal opioid withdrawal syndrome, which may be life-threatening if not recognized and treated (see WARNINGS; Pregnancy). Inform female patients of reproductive potential that acetaminophen and codeine phosphate tablets can cause fetal harm and to inform the prescriber of a known or suspected pregnancy (see PRECAUTIONS; Pregnancy). Advise women that breastfeeding is not recommended during treatment with acetaminophen and codeine phosphate tablets (see PRECAUTIONS; Nursing Mothers)]. Inform patients that acetaminophen and codeine phosphate tablets may impair the mental and/or physical abilities required for the performance of potentially hazardous tasks such as driving a car or operating machinery and to avoid such tasks while taking this product, until they know how they will react to the medication. Advise patients to properly dispose of acetaminophen and codeine phosphate tablets. 1. Remove them from their original containers and mix them with an undesirable substance, such as used coffee grounds or kitty litter (this makes the drug less appealing to children and pets, and unrecognizable to people who may intentionally go through the trash seeking drugs). 2. Place the mixture in a sealable bag, empty can, or other container to prevent the drug from leaking or breaking out of a garbage bag, or dispose of unused tablets in accordance with local state guidelines and/or regulations. Codeine is metabolized by CYP2D6 to form morphine. The concomitant use of acetaminophen and codeine phosphate tablets and CYP2D6 inhibitors (e.g., paroxetine, fluoxetine, bupropion, quinidine) can increase the plasma concentration of codeine, but can decrease the plasma concentration of active metabolite morphine, which could result in reduced analgesic efficacy or symptoms of opioid withdrawal, particularly when an inhibitor is added after a stable dose of acetaminophen and codeine phosphate tablets are achieved (see CLINICAL PHARMACOLOGY). If concomitant use with a CYP2D6 inhibitor is necessary, or if a CYP2D6 inhibitor is discontinued after concomitant use, consider dosage adjustment of acetaminophen and codeine phosphate tablets and monitor patients closely at frequent intervals. If concomitant use with CYP2D6 inhibitors is necessary, follow the patient for reduced efficacy or signs and symptoms of opioid withdrawal and consider increasing the acetaminophen and codeine phosphate tablets as needed. After stopping use of a CYP2D6 inhibitor, consider reducing the acetaminophen and codeine phosphate tablets and monitor the patient for signs and symptoms of respiratory depression or sedation. The concomitant use of acetaminophen and codeine phosphate tablets and CYP3A4 inhibitors, such as macrolide antibiotics (e.g., erythromycin), azole-antifungal agents (e.g. ketoconazole), and protease inhibitors (e.g., ritonavir), may result in an increase in codeine plasma concentrations, with subsequently greater metabolism by cytochrome CYP2D6, resulting in greater morphine levels, which could increase or prolong adverse reactions and may cause potentially fatal respiratory depression, particularly when an inhibitor is added after a stable dose of acetaminophen and codeine phosphate tablets is achieved (see WARNINGS)]. If concomitant use of CYP3A4 inhibitor is necessary, consider dosage reduction of acetaminophen and codeine tablets until stable drug effects are achieved. Monitor patients for respiratory depression and sedation at frequent intervals. If a CYP3A4 inhibitor is discontinued, consider increasing the acetaminophen and codeine phosphate tablets dosage until stable drug effects are achieved. Monitor for signs of opioid withdrawal. The concomitant use of acetaminophen and codeine phosphate tablets and CYP3A4 inducers (e.g., rifampin, carbamazepine, phenytoin) can result in lower codeine levels, greater norcodeine levels, and less metabolism via 2D6 with resultant lower morphine levels (see CLINICAL PHARMACOLOGY), resulting in decreased efficacy or onset of a withdrawal syndrome in patients who have developed physical dependence (see WARNINGS). If concomitant use of a CYP3A4 inducer is necessary, follow the patient for reduced efficacy and signs of opioid withdrawal and consider increasing the acetaminophen and codeine phosphate tablets dosage as needed. If a CYP3A4 inducer is discontinued, consider acetaminophen and codeine phosphate tablets dosage reduction and monitor for signs of respiratory depression and sedation at frequent intervals. The concomitant use of opioids with other drugs that affect the serotonergic neurotransmitter system has resulted in serotonin syndrome. Examples of these drugs include, selective serotonin reuptake inhibitors (SSRIs), serotonin and norepinephrine reuptake inhibitors (SNRIs), tricyclic antidepressants (TCAs), triptans, 5-HT3 receptor antagonists, drugs that effect the serotonin neurotransmitter system (e.g., mirtazapine, trazodone, tramadol), and monoamine oxidase (MAO) inhibitors (used to treat psychiatric disorders and also others, such as linezolid and intravenous methylene blue) (see PRECAUTIONS; Information for Patients). If concomitant use is warranted, carefully observe the patient, particularly during treatment initiation and dose adjustment. Discontinue acetaminophen and codeine phosphate tablets immediately if serotonin syndrome is suspected. Advise patients taking acetaminophen and codeine phosphate tablets not to use MAOIs or within 14 days of stopping such treatment. If urgent use of an opioid is necessary, use test doses and frequent titration of small doses of other opioids (such as oxycodone, hydrocodone, oxymorphone or buprenorphine) to treat pain while closely monitoring blood pressure and signs and symptoms of CNS and respiratory depression. The concomitant use of opioids with other opioid analgesics, such as butorphanol, nalbuphine, pentazocine, may reduce the analgesic effect of acetaminophen and codeine phosphate tablets and/or precipitate withdrawal symptoms. Acetaminophen and codeine may enhance the neuromuscular blocking action of skeletal muscle relaxants and produce an increased degree of respiratory depression. If concomitant use is warranted, monitor patients for signs of respiratory depression that may be greater than otherwise expected and decrease the dosage of acetaminophen and codeine phosphate tablets and/or the muscle relaxant as necessary. If concomitant use is warranted, monitor patients for signs of urinary retention or reduced gastric motility when acetaminophen and codeine phosphate tablets are used concomitantly with anticholinergic drugs. There are no adequate and well-controlled studies in pregnant women. Acetaminophen and codeine phosphate tablets should be used during pregnancy only if the potential benefit justifies the potential risk to the fetus. Opioids cross the placenta and may produce respiratory depression and psycho-physiologic effects in neonates. An opioid antagonist, such as naloxone, must be available for reversal of opioid-induced respiratory depression in the neonate. Acetaminophen and codeine phosphate tablets are not recommended for use in pregnant women during or immediately prior to labor, when other analgesic techniques are more appropriate. Opioid analgesics, including acetaminophen and codeine phosphate tablets, and can prolong labor through actions which temporarily reduce the strength, duration, and frequency of uterine contractions. However, this effect is not consistent and may be offset by an increased rate of cervical dilation, which tends to shorten labor. Monitor neonates exposed to opioid analgesics during labor for signs of excess sedation and respiratory depression. There is no information on the effects of codeine on milk production. Because of the potential for serious adverse reactions, including excess sedation, respiratory depression, and death in a breastfed infant, advise patients that breastfeeding is not recommended during treatment with acetaminophen and codeine phosphate tablets (see WARNINGS). If infants are exposed to acetaminophen and codeine phosphate tablets through breast milk, they should be monitored for excess sedation and respiratory depression. Withdrawal symptoms can occur in breastfed infants when maternal administration of an opioid analgesic is stopped, or when breastfeeding is stopped. The safety and effectiveness of acetaminophen and codeine phosphate tablets in pediatric patients below the age of 18 have not been established. Avoid the use of acetaminophen and codeine phosphate tablets in adolescents 12 to 18 years of age who have other risk factors that may increase their sensitivity to the respiratory depressant effects of codeine unless the benefits outweigh the risks. Risk factors include conditions associated with hypoventilation, such as postoperative status, obstructive sleep apnea, obesity, severe pulmonary disease, neuromuscular disease, and concomitant use of other medications that cause respiratory depression (see WARNINGS). Elderly patients (aged 65 years or older) may have increased sensitivity to acetaminophen and codeine phosphate tablets. In general, use caution when selecting a dosage for an elderly patient, usually starting at the low end of the dosing range, reflecting the greater frequency of decreased hepatic, renal, or cardiac function and of concomitant disease or other drug therapy. Respiratory depression is the chief risk for elderly patients treated with opioids, and has occurred after large initial doses were administered to patients who were not opioid-tolerant or when opioids were co-administered with other agents that depress respiration. Titrate the dosage of acetaminophen and codeine phosphate tablets slowly in geriatric patients and monitor closely for signs of central nervous system depression (see WARNINGS). Acetaminophen and codeine phosphate tablets contain codeine. Codeine in combination with acetaminophen, is a Schedule III controlled substance. Acetaminophen and codeine phosphate tablets contain codeine, a substance with a high potential for abuse similar to other opioids, including fentanyl, hydrocodone, hydromorphone, methadone, morphine, oxycodone, oxymorphone, and tapentadol. Acetaminophen and codeine phosphate tablets can be abused and are subject to misuse, addiction, and criminal diversion (see WARNINGS). â€œDrug-seekingâ€ behavior is very common in persons with substance use disorders. Drug-seeking tactics include emergency calls or visits near the end of office hours, refusal to undergo appropriate examination, testing, or referral, repeated â€œlossâ€ of prescriptions, tampering with prescriptions and reluctance to provide prior medical records or contact information for other treating health care providers. â€œDoctor shoppingâ€ (visiting multiple prescribers to obtain additional prescriptions) is common among drug abusers and people suffering from untreated addiction. Preoccupation with achieving adequate pain relief can be appropriate behavior in a patient with poor pain control. Acetaminophen and codeine phosphate tablets are for oral use only. Abuse of acetaminophen and codeine phosphate tablets poses a risk of overdose and death. The risk is increased with concurrent use of acetaminophen and codeine phosphate tablets with alcohol and other central nervous system depressants. Acetaminophen and codeine phosphate tablets should not be abruptly discontinued (see DOSAGE AND ADMINISTRATION). If acetaminophen and codeine phosphate tablets are abruptly discontinued in a physically dependent patient, a withdrawal syndrome may occur. Some or all of the following can characterize this syndrome: restlessness, lacrimation, rhinorrhea, yawning, perspiration, chills, myalgia, and mydriasis. Other signs and symptoms also may develop, including: irritability, anxiety, backache, joint pain, weakness, abdominal cramps, insomnia, nausea, anorexia, vomiting, diarrhea, or increased blood pressure, respiratory rate, or heart rate. The opioid antagonists, naloxone or nalmefene, are specific antidotes to respiratory depression resulting from opioid overdose. For clinically significant respiratory or circulatory depression secondary to acetaminophen and codeine overdose, administer an opioid antagonist. Opioid antagonists should not be administered in the absence of clinically significant respiratory or circulatory depression secondary to codeine overdose. Because the duration of opioid reversal is expected to be less than the duration of action of codeine in acetaminophen and codeine phosphate tablets, carefully monitor the patient until spontaneous respiration is reliably reestablished. If the response to an opioid antagonist is suboptimal or only brief in nature, administer additional antagonist as directed by the productâ€™s prescribing information. There is inter-patient variability in the potency of opioid drugs and opioid formulations. Therefore, a conservative approach is advised when determining the total daily dosage of acetaminophen and codeine phosphate tablets. It is safer to underestimate a patientâ€™s 24-hour acetaminophen and codeine phosphate tablets dosage than to overestimate the 24-hour acetaminophen and codeine phosphate tablets dosage and manage an adverse reaction due to overdose. When a patient who has been taking acetaminophen and codeine phosphate tablets regularly and may be physically dependent no longer requires therapy with acetaminophen and codeine phosphate tablets, taper the dose gradually, by 25% to 50% every 2 to 4 days, while monitoring carefully for signs and symptoms of withdrawal. If the patient develops these signs or symptoms, raise the dose to the previous level and taper more slowly, either by increasing the interval between decreases, decreasing the amount of change in dose, or both. Do not abruptly discontinue acetaminophen and codeine phosphate tablets in a physically-dependent patient (see WARNINGS, DRUG ABUSE AND DEPENDENCE). Acetaminophen and Codeine Phosphate Tablets, USP 300 mg /30 mg are white, round, flat, beveled edged tablets debossed â€œIP 33â€ on obverse and â€œ3â€ on reverse. Store Acetaminophen and Codeine Phosphate Tablets, USP 300 mg/30 mg at 20° to 25°C (68° to 77°F) [see USP Controlled Room Temperature]. Get emergency help right away if you take too many acetaminophen and codeine phosphate tablets (overdose). When you first start taking acetaminophen and codeine phosphate tablets, when your dose is changed, or if you take too much (overdose), serious or life-threatening breathing problems that can lead to death may occur. Do not give acetaminophen and codeine phosphate tablets to a child younger than 12 years of age. Do not change your dose. Take acetaminophen and codeine phosphate tablets exactly as prescribed by your healthcare provider. Use the lowest dose possible for the shortest time needed. After you stop taking acetaminophen and codeine phosphate tablets dispose of any unused tablets in accordance with local state guidelines and/or regulations.